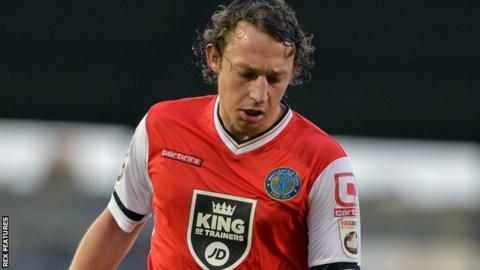 Kristian Dennis' hat-trick helped Macclesfield to a convincing National League victory at Woking. Danny Whitehead gave The Silkmen the lead from Chris Holroyd's low cross before Dennis' 25-yard strike doubled the lead from Paul Lewis' flick-on. Neill Byrne converted Tony Diagne's pass for 3-0 before Dennis scored his second from Whitehead's through-ball. Dan Holman pulled one back for Woking before Dennis completed his hat-trick and Joey Jones netted a consolation. "It's a disappointing day and you can't make excuses, even though there are things behind the scenes on what goes around football clubs. "We are where we are as a team and you don't turn around and look at the situation and make excuses and defend the game. "As club, as a team and as a manager we are in for a hard winter and certain things have happened, like losing players over the course of the season." Match ends, Woking 2, Macclesfield Town 5. Second Half ends, Woking 2, Macclesfield Town 5. Foul by Dan Holman (Woking). Neill Byrne (Macclesfield Town) wins a free kick. Jack Sampson (Macclesfield Town) hits the woodwork with a left footed shot from outside the box. Assisted by Paul Turnbull. Attempt saved. Dan Holman (Woking) left footed shot from outside the box is saved. Goal! Woking 2, Macclesfield Town 5. Joey Jones (Woking) with an attempt from the left side of the six yard box to the bottom left corner. Assisted by Jake Caprice with a cross. Attempt blocked. Joey Jones (Woking) with an attempt from the left side of the six yard box is blocked. Attempt missed. Paul Turnbull (Macclesfield Town) right footed shot from outside the box misses to the right from a direct free kick. Foul by Cameron Norman (Woking). Danny M. Rowe (Macclesfield Town) wins a free kick. Substitution, Macclesfield Town. Reece Styche replaces Kristian Dennis. Substitution, Macclesfield Town. Jack Sampson replaces Danny Whitehead. Goal! Woking 1, Macclesfield Town 5. Kristian Dennis (Macclesfield Town) left footed shot from outside the box to the bottom right corner. Assisted by Danny Whitaker. Attempt blocked. Kristian Dennis (Macclesfield Town) left footed shot from outside the box is blocked. Substitution, Macclesfield Town. Danny M. Rowe replaces Paul Lewis. Goal! Woking 1, Macclesfield Town 4. Dan Holman (Woking) right footed shot from the right side of the six yard box to the bottom left corner. Assisted by John Goddard. Attempt blocked. Dan Holman (Woking) right footed shot from the right side of the six yard box is blocked. Attempt missed. David Fitzpatrick (Macclesfield Town) left footed shot from outside the box is too high. Substitution, Woking. Bruno Andrade replaces Matt Robinson. Substitution, Woking. Jake Caprice replaces Terell Thomas. Attempt missed. Kristian Dennis (Macclesfield Town) left footed shot from the left side of the box misses to the left. Goal! Woking 0, Macclesfield Town 4. Kristian Dennis (Macclesfield Town) left footed shot from the left side of the box to the bottom right corner. Assisted by Danny Whitehead. Attempt blocked. Kristian Dennis (Macclesfield Town) left footed shot from the left side of the box is blocked. Attempt missed. Kadell Daniel (Woking) left footed shot from outside the box is too high. Offside, Macclesfield Town. Kristian Dennis tries a through ball, but Kristian Dennis is caught offside. Attempt blocked. Brian Saah (Woking) right footed shot from the right side of the box is blocked. Attempt blocked. John Goddard (Woking) left footed shot from outside the box is blocked. Attempt blocked. Danny Whitehead (Macclesfield Town) right footed shot from outside the box is blocked. Goal! Woking 0, Macclesfield Town 3. Neill Byrne (Macclesfield Town) left footed shot from the left side of the box to the bottom right corner. Assisted by Tony Diagne. Attempt blocked. Neill Byrne (Macclesfield Town) left footed shot from the left side of the box is blocked. Foul by Terell Thomas (Woking). Danny Whitehead (Macclesfield Town) wins a free kick. Attempt missed. John Goddard (Woking) right footed shot from outside the box misses to the right.